Articulating a need for a separation of church and state was enough to get Thomas Jefferson cut out of history textbooks by the Texas Board of Education earlier this year. Imagine how many calls to ban Jefferson there would be if more people were aware that Jefferson less famously emphasized a similar need for a distinction between commerce and democracy, a separation of corporation and state if you will. Jefferson wrote, "I hope we shall crush in its birth the aristocracy of our monied corporations which dare already to challenge our government to a trial of strength and bid defiance to the laws of our country." Jefferson was deeply wary of corporate power and believed if the people were to govern themselves corporations needed to be kept on a short leash politically. And he wasn't alone. For the better part of the new nation's first century, corporations operated under revocable charters confining them to strictly commercial activities and requiring them to serve the public interest. With the Tea Party movement all the rage in our current moment, people forget that the original Boston Tea Party was not only a protest of British rule but also specifically an act of civil disobedience against the British East India Trading Company. Those tea partiers understood how unrestrained corporate power went hand in hand with political oppression. My, how that understanding has waned. Target Corporation is now in the news for its decision to pump $150,000 into the race for governor in Minnesota, one of the early manifestations of the U.S. Supreme Court's ruling in January that corporations can spend as much as they like to influence elections. By backing a candidate who strongly opposes gay rights, Target now finds itself scrambling to reassure gay customers and employees there is no bigotry behind the company's political activities. In trying to smooth things over, Target's top management is revealing something other corporate execs have been loathe to publicly acknowledge, namely that they sink money into elections strictly to enhance their bottom line. Or as Target's CEO said in a letter to employees, "to advance policies aligned with our business objectives." To hell with civil rights. To hell with social justice. To hell with what's best for the whole country. To hell with any concern for the common good. Governing this nation is about nothing more than a single-minded pursuit of "business objectives." This is what will be reaped from what the Supreme Court sowed with its decision in the Citizens United case. In the hours before political candidates file their campaign finance reports, their campaigns issue ritual statements showcasing their numbers and generally boasting about their fundraising prowess, complete with a stock claim that most of the donors gave small amounts of money. What they don't tell you is that most of the funds raised came from a few who gave exceedingly large sums. Mark Neumann's campaign for governor didn't deviate from the standard boilerplate in summarizing its fundraising over the first half of the year. The statement issued a few days ago says the campaign raised $1.96 million in the six-month period, adding that 96% of the donors are from Wisconsin and 85% gave $99 or less. There's a lot in the Neumann camp's statement that leaves you scratching your head. The actual report his campaign filed with the state Government Accountability Board lists $2,844,282 in contributions, not $1.96 million. And if you look at who gave the slightly more than $2.8 million the campaign reported, you find that $2,525,170 came from Neumann's own pocket. Scott Walker and Tom Barrett also closely followed the well-worn script in describing their fundraising. Both claim a substantial majority of their supporters donate small amounts. Like Neumann, neither Walker nor Barrett says anything about where most of their money comes from. We will be filling in that blank in the weeks to come. I'm betting that what we find will look an awful lot like what we found in the last race for governor in 2006. Our findings mirror those of the national Campaign Finance Institute, which monitors election financing at the state and national levels. As the bar chart below illustrates, CFI's analysis of fundraising by candidates for state office in Wisconsin the last time we had a race for governor in 2006 shows that less than one-seventh of campaign money came from individuals giving $100 or less, while the lion's share of funds were donated by far more generous donors. It could be worse. Like Illinois. On the other hand, Wisconsin could do much better. Like Minnesota. There's a reason why Minnesota candidates have come to rely so much more heavily on donors who give smaller amounts of money. For years, Minnesota has had a program that provided rebates of up to $50 to state residents who make small donations to political candidates. Wisconsin could adopt such a program and join our neighbor to the west in encouraging citizen participation in state elections and weaning candidates from their reliance on big-money donors. Actually, it would be more accurate to say that Wisconsin could trade places with Minnesota. Our neighbor to the west just suspended its small-donor incentive program. You can hardly blame people for having a tough time telling the difference between the two major parties, what with their slavish devotion and ceaseless pandering to big-money interests. On the other hand, there are obvious distinctions. For starters one party is scary, the other scared. Some other distinguishing features are caricatures. One is the party of government, the other the party of free markets. To the extent there is truth in that exaggerated simplification, both parties have their work cut out for them. The latest poll by the University of Wisconsin Survey Center shows most state residents don't have much use for public officials. Two-thirds of respondents said they trust state officials "only some of the time." Two-thirds also said public officials "don't care much what people like me think." Well over half of those polled believe that government is "run by a few big interests" looking out for themselves and agree with the statement, "People like me don't have any say about what the government does." When asked how many people running the state are crooked, only 7% said "none" and 28% answered "only a few," while 42% said "some" and almost one in five said "most" or "nearly all." As disillusioned as Wisconsinites clearly are with politics and politicians, the UW poll shows even deeper misgivings with the suits in the corporate boardrooms. Asked where they place their faith when it comes to fixing the economy, 52% of respondents said they trust a "strong government" while 40% said "the free market." Given the low regard people have for government and public officials these days, that's like saying if there has to be either a child molester or an ax murderer living next door, they'll take the child molester. Milwaukee Mayor and Democratic candidate for governor Tom Barrett yesterday put forward a plan for changing the way legislative and congressional redistricting is handled. May he not be the last public official in the state to tackle this issue. Lord knows the current system needs improving. The way it's worked is that legislators get to draw new district lines every 10 years after each census, and the lines they draw are tailor-made for their reelection. Democrats find ways to pack as many Democratic voters as possible in their districts, and Republicans load their districts with GOP voters. In the vast majority of congressional and state legislative contests, the outcome is a foregone conclusion because of the lopsided political makeup of the districts. Much is made of how Wisconsin is a purple state, evenly divided between Republicans and Democrats. But individual districts are bright red or dark blue. At present Wisconsin arguably has only one competitive congressional district, the Green Bay area's 8th district. In fact, since 2000 only two U.S. House races have been competitive (with a margin of victory within 10 points), the 2000 election in the 2nd district and the 2006 election in the 8th. Depending on the election year, either 116 or 117 state legislative seats are up for grabs. Over the last 10 years, the number of competitive elections has ranged from a low of 10 to a high of 29. While this is a raw deal for voters, it's great for incumbent office holders. Since 2000, state legislative incumbents have been reelected 95% of the time. In 2000, incumbents won 102 times and lost three. In 2002, they went 89-6. In 2004, 91-4. In 2006, 97-9. And in 2008, 99-3. State politicians go to great lengths to achieve these results. They spent somewhere between $2.6 million and $2.9 million of our money on consultants, personnel and legal expenses for the 2000 redistricting. 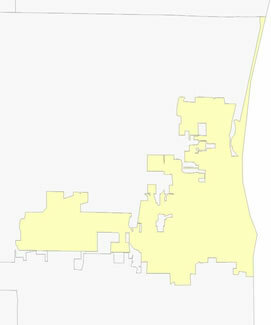 And sometimes they had to draw weirdly shaped districts to enhance the job security of incumbents. The 64th Assembly district (pictured at right - click on image to enlarge) in the Kenosha area was named one of the 10 ugliest districts in America in a state-by-state analysis released this April by the Rose Institute. Yesterday a divided Wisconsin Supreme Court quietly finalized new rules allowing state judges to decide cases involving their biggest campaign supporters. This new ethical standard was proposed by two of the state's most powerful lobbying groups, Wisconsin Manufacturers and Commerce and the Wisconsin Realtors Association. The rules stand in direct contradiction with the U.S. Supreme Court's 2009 ruling in Caperton v. Massey that a West Virginia Supreme Court justice had a duty to withdraw from a case involving a major campaign supporter and his failure to do so violated the Due Process Clause of the Fourteenth Amendment that protects the right to a fair trial. Four of the state Supreme Court's seven justices - Patience Roggensack, David Prosser, Annette Ziegler and Michael Gableman - ignored the Caperton decision and sided with WMC and the Realtors on the amendment to Wisconsin's judicial ethics code. This move came on the heels of Prosser, Ziegler and Roggensack blocking disciplinary action against Gableman for authorizing an untruthful campaign ad. Gableman stood accused of judicial misconduct for violating the part of the ethics code prohibiting judges from making false statements about an election opponent. Gableman's ad claimed Louis Butler "found a loophole" and implied a child molester got off on a technicality of Butler's making and "went on to molest another child." Trouble is, the man Butler was representing as a public defender didn't get off. He was never released until he had served his entire sentence. Only after that did he commit another crime. The ad was a lie. And an obvious violation of the judicial ethics code. Prosser, Ziegler and Roggensack overlooked the plain facts in Gableman's misconduct case and ignored the plain meaning of the judicial ethics code. They refused to conclude that Gableman's ad was untruthful. It was just "distasteful," they ruled. And protected speech under the First Amendment. The justices don't have a leg to stand on between the three of them on the truthfulness of the ad. It was way beyond distasteful. It was a lie. Invoking free speech was a far more clever maneuver. It made letting Gableman off appear somehow principled. There is no disputing that Gableman had the right to say what he said about Butler. But that doesn't mean he shouldn't be held accountable for violating the judicial ethics code. Employees have the right to publicly say their bosses are total losers. But they shouldn't be at all surprised if that free speech gets them fired. General Stanley McCrystal and his aides had every right to say what they said to Rolling Stone magazine. President Obama also was entirely within his rights when he relieved McCrystal of his duties. The right to speak is constitutionally protected. But that doesn't mean speech has no consequences under any circumstances. Justices Prosser, Ziegler and Roggensack waived application of that common sense to their colleague and ideological soulmate Michael Gableman. Some might even be tempted to say they found a loophole in the state judicial ethics code. Columnist Joel McNally said it best: "This time a lowlife really did get off on a technicality."